A larger photo of Captain Camm is shown below. 2nd Battalion Yorkshire Regiment. Killed 7 January 1918. Captain Camm lost his life in the Hedge Street Tunnel Fire, in which 21 men were killed. John Hamblin (<jc.hamblin@btopenworld.com>) has researched the service of Captain Camm in the Yorkshire Regiment, and together with research by Robert Coulson (1956 - 2008). Bertram Camm was born at Poppleton near York on July 2nd 1893. 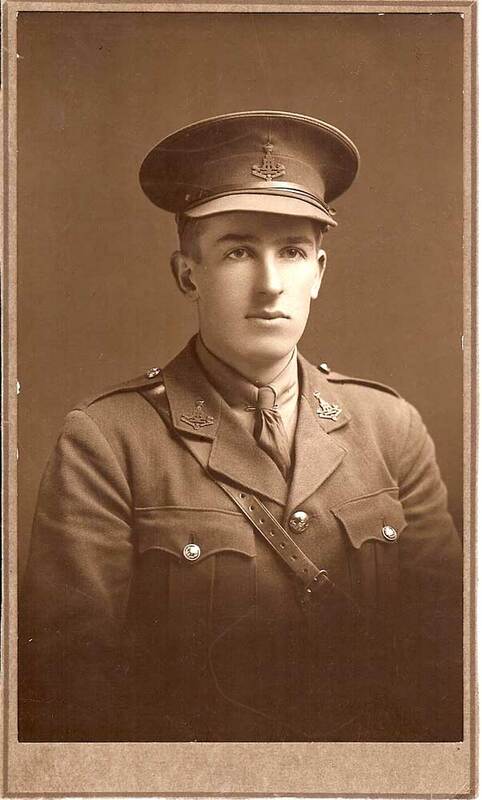 He joined the Inns of Court Officer Training Corps in May 1915 and was commissioned in July 1915 when he was attached to the 7th battalion and joined them in the Ypres Salient. July 1st 1916 saw the 7th Battalion attack the village of Fricourt at 2-30pm suffering grievous losses, 2nd Lt Camm being wounded in this action. Tthe above information provided by Robert Coulson, 1956 - 2008. All remaining information provided by John Hamblin. Bertram Camm was promoted to Lieutenant on the 1st of July 1917 and on the 18th of July 1917 he was appointed to Acting Captain whilst in command of a company. On the 7th of April 1917 the Battalion marched up to the front from Bellacourt via Agny to Blaireville in readiness for their attack which was to take place on the morning of the 9th being the opening day of the Battle of Arras. The Battalion were part of 21st Infantry Brigade, 30th Division in VII Corps which stood in front of the village of Wancourt. The battle opened at 5.30am with a “tornado” of shellfire, following which the British infantry moved forward and took all their objectives with the exception of the enemy’s trenches at the base of Hill 145 at the northern end of Vimy Ridge where heavy close quarter fighting took place. The 2nd Battalion’s objective was immediately to the east of Neuville Vitasse, the preliminary bombardment was very light and they were to advance across two thousand yards in support of 18th Battalion the King’s Liverpool Regiment. They advanced in two parties the first following the King’s who made it to the German wire but due to the light artillery preparation was not cut. The first party of the 2nd Battalion Yorkshire Regiment became mixed up with the King’s in front of the German wire and took to shell holes for protection and began linking them with shallow trenches to form a line. The next wave across was the 2nd Battalion Wiltshire Regiment together with the second party of 126 Green Howards under Captain W.H. Colley followed close behind to act as “moppers up”. This latter group included 2nd Lieutenant Camm. The action involved entering the German trenches immediately after the lead battalion and despatching those enemy troops, missed by the assault unit, who were in dugouts or strong points, - either despatching or capturing them. The Wiltshires were also held by the wire and unable to find any gaps in the wire, fell back leaving the Yorkshires in the vanguard. The Yorkshire men remained huddled in front of the German wire under fire until ordered by 2nd Lt Camm to fall back to the St Martin-Neuville Vitasse Road where the now wounded Camm and his party established themselves. The party remained there until relived early on the morning of the 10th of April. It is for this action that he was awarded the Military Cross. The Battalion were due to be relieved by the Division reliving them didn’t arrive so their departure was delayed. “Shortly after the time we should have been relieved, had the 20th Division arrived in time, a fire broke out in the tunnel, and from what the Medical Officer, who was with Headquarters at the time, stated, it appears that about midnight, looking up to the ceiling of the tunnel, he saw a streak of flame. He at once gave the alarm, and everybody was roused and told to get out of the tunnel as quickly as possible. Before many seconds had elapsed the tunnel was one mass of flame and black smoke. Lieutenant Picken saved many lives by his brave conduct in staying at the bottom of the stairs and pushing and guiding the men which way to go; as it was impossible for them to see. The CO Major (Willard Claude Kennedy) Birch was seen to be moving about, and it was thought that he would be able to get out; but it appears that as soon as he learnt that everyone was not out of the tunnel, he went back into the flames again to see if he could save anyone. He was not seen alive again. He and the adjutant Lieutenant Harold Dean and the whole of the officers of B Company-Captain Bertram Cunliffe Camm MC, 2nd Lieutenants Gilbert Parker Smith, John Symon and Willard Barber also one officer of the Royal Engineers, an officer of the Shropshire Light Infantry and a Church of England Brigade Chaplain along with twelve men of the battalion were all burned to death. All these men belonged to our Battalion Headquarters staff and many of them were signallers and most of them had been with the battalion throughout the whole war. It’s likely that the 7th was the date that the men of the 20th Division opened up the tunnel after the 2nd Battalion had moved on. 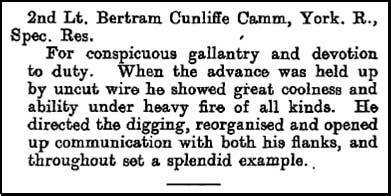 Bertram Camm is commemorated at Railway Dugouts Burial Ground Special Memorial G7 two kilometres south east of Ypres. The special memorial is for names of casualties who were buried at Valley Cottages Cemetery and Transport Farm Annexe Cemetery where the graves were lost if subsequent fighting.